A modular intelligence test battery constructed on theory-led principles and designed to measure work-related abilities both fairly and economically. Assessment of intelligence level and intelligence structure, for subjects age 14 and over. Decision-making in the fields of education, further education and career choice; ability-related aspects of aptitude assessment; educational psychology; work psychology, commercial / industrial and organizational psychology. As a decision-oriented psychological assessment tool the INSBAT is constructed modularly, so that only items of a type relevant to the purpose of the investigation need to be presented. The theoretical basis is the hierarchical Gf-Gc theory of Horn (1989; Horn & Noll, 1997) and the Three Layer theory of Carroll (2003) which is a further development of the Gf-Gc theory. Working on the inter-correlations between individual measures of the primary factors, Horn and Cattell (1978) extracted nine broadly based second order factors which together provide a global assessment of an individual's intellectual ability. The validity of this factor structure has been confirmed in a number of replicative studies carried out in different parts of the world (e.g. Brickley, Keith & Wolfe, 1995; Carroll, 1989; Gustafson, 1984; Horn & Stankov, 1982; Undheim & Gustafsson, 1987). Fluid intelligence: The ability to recognize relationships between stimuli, to understand implications and to draw logical conclusions (subtests: Numerical-inductive thinking, Figural-inductive thinking). Short-term memory: The ability to retain visual and verbal information in the short term and to reproduce it accurately (subtests: visual short-term memory). Crystallised intelligence: The breadth and depth of acquired cultural knowledge such as word fluency and the understanding of language and words (subtests:Lexical Knowledge, Verbal Fluency). Short-term memory: the ability to retain visual and verbal information in the short term and to reproduce it accurately (subtests: Visual Short-term Memory, Verbal Short-term Memory). Long-term memory: the ability to retain information in the longer term, integrate it into one's own knowledge base and recall it accurately (subtest: Long-term Memory). Visual processing: the ability to imagine how objects will look after they have been mentally rotated or transformed (subtest: Spatial Perception). Decision quality: defined as the number of basal cognitive operations required in order to make a fast and accurate decision in the context of non-trivial tasks(subtest: Decision Quality). Quantitative reasoning: the ability to understand and apply mathematical skills and concepts (subtests: Computational Estimation, Arithmetical Competence, Numerical Flexibility, Algebraic Reasoning). In all there are therefore 15 subtests available. The items of the individual subtests have been devised with the aid of various approaches to Automatic Item Generation (AIG: Arendasy & Sommer, in press; Irvine & Kyllonen, 2002), taking account of up-to-date research findings in the cognitive sciences and applied psychometrics. The items were constructed either by human item writers or completely automatically using item generators. With regard to the psychometric properties of the item material it was considered important that 1) the items of the individual subtests should be scaleable in accordance with the 1PL Rasch model and 2) the theoretical model on which the items are based should be able to explain at least 50% of the variance in the item difficulty parameters. This has the advantages for the practitioner of scaling fairness and unambiguity of interpretation of the individual subtest results. The INSBAT has been designed as a modular intelligence test battery. This means that only those subtests that are relevant to the purpose of the particular assessment situation need to be presented. This can be done using the Variable Form I (S1) or the Variable Form II (S2). While Form S1 allows only for the choice of subtests to be changed, Form S2 incorporates the additional possibility of changing the order of the subtests and the end conditions of the adaptive tests in line with the requirements of the test situation. These two test forms are particularly useful for predicting educational and career success in fields where there are clearly defined requirement profiles. For the differentiated assessment of intelligence level and intelligence structure each secondary factor should be measured by a marker subtest (Figural Inductive Reasoning, Lexical Knowledge, Visual Short-term Memory, Long-term Memory, Spatial Perception, and Inspection Time). To complement the picture a second subtest can be administered for each secondary factor, thus ensuring that the whole breadth of the secondary factor's content is adequately covered. This approach is realised in the Global Form (S3). According to Schmidt and Hunter (1998), this testing method is particularly suitable for predicting the work-related performance of people in occupations involving very diverse and heterogeneous activities. If insufficient time is available for the separate assessment of an individual's different abilities, the Short Form (S4) can be used. Each subtest is provided with standardised instructions and practice examples based on the principles of programmed instruction and "mastery learning". Depending on the subtest, the subject's answers are given either in multiple choice format or as automated free responses. The tasks in the individual subtests are presented partly in power test form and partly with a time limit on each item. In 11 of the subtests the items are presented as an adaptive test (CAT) with the test starting point being selected on the basis of socio-demographic data; this maximizes the information gained without using items that are either too easy or too difficult for the respondent. For each of the selected subtests the ability parameter in accordance with the Rasch model is reported. While the number of correctly worked items is merely a measure of an individual's performance, the ability parameter makes it possible to estimate the underlying, latent ability dimension. This represents an important and at the same time diagnostically necessary inferential step. This inferential step is, however, linked to the fit of the Rasch model, which has been demonstrated for the subtests of the INSBAT (cf. van der Linden & Hambelton, 1997). If more than one subtest relating to a particular secondary factor has been selected, an ability parameter is calculated for that secondary factor. The ability parameter for the general factor general intelligence (G) is calculated if at least one subtest has been selected for four of the six secondary factors fluid intelligence (Gf), crystallised intelligence (Gc), visual processing (Gv), quantitative reasoning (Gq), short-term memory (Gstm) and long-term memory (Gltm). Alongside the provision of the ability parameters and factor scores a norm comparison (percentile ranks and IQ; confidence interval) is carried out. At the conclusion of testing the results are displayed both in tabular form and as a profile, and these can be printed out. 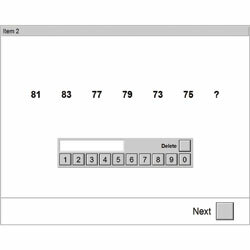 The test protocol for each subtest provides a record of the latency times for each item, the selected answer, scoring information and statistics relating to the adaptive process. In addition the INSBAT has provision for transferring the test results automatically into a report template. Due to the adaptive presentation mode used in some subtests and the validity of a probabilistic test model that this requires, any desired level of reliabiity can be achieved. For reasons of economy the reliability of the individual task groups lies between r = .70 and r = .95. The stability of the subtests after some 15 months fluctuates between r= .63 and r = .87. The construct representation (Embretson, 1983) of the individual INSBAT subtests has been demonstrated in studies in which the item difficulties were predicted from task characteristics derived from the theoretical models for the solving of these types of tasks. The multiple correlations between the item difficulty parameters of the Rasch model (Rasch, 1980) and the item characteristics thus obtained fluctuate for the individual subtests between R=0.70 and R=0.97. This means that between 50% and 94% of the difference in the difficulties of the individual items can be explained by the theoretical models on which construction of the items in the individual subtests is based. In addition, a number of studies of the nomothetic span (Embretson, 1983) of the individual subtests are now available. A study by Sommer and Arendasy (2005; Sommer, Arendasy & Häusler, 2005) provided evidence of construct validity for the test battery as a whole and for the global form and short form. By means of a confirmatory factor analysis the authors were able to confirm the theory-led assignment of the individual subtests to the secondary factors of the Cattell- Horn-Carroll model. These results were supplemented by studies carried out by Arendasy and Sommer (2007) and Arendasy, Hergovich and Sommer (2008), in which the results previously reported were replicated on an independent sample using alternative subtests. Evidence of the criterion validity of the individual INSBAT subtests has come from the fields of aviation psychology (selection of trainee pilots) and educational counselling (prediction of student success at universities of applied sciences). Norms are available for 904 adults aged between 16 and 73, as well as norms of a sample of 1595 young people aged between 12 and 15. Both norms are also available separated according to age, gender and education. The time required for completing the Variable Form I (S1) and the Variable Form II (S2) depends on the subtests selected and the chosen reliability. The length of the individual subtests varies between 3 and 40 minutes. In the case of forms S3 and S4, which consist of a fixed sequence of subtests, the time required for the tests is 2 hours 52 minutes and 1 hour 27 minutes respectively.